Click on a category above to see more photos! 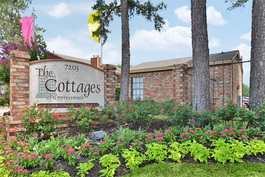 Welcome to The Cottages of Cypresswood, a peaceful community with one and two bedroom apartments for rent in Spring, TX. These homes have gourmet kitchens, sleek flooring, cozy fireplaces and exclusive access to private amenities. Exterior – Tranquil water features and beautifully manicured landscaping give The Cottages of Cypresswood its lavish yet easygoing feel. Leasing Office – Come by the leasing office today for more information about this newly renovated apartment community. Pool – Cool off on a sunny day with a refreshing dip in the swimming pool. Pond – Pack a picnic and spend the day fishing at the catch-and-release pond. Bedroom – Retreat to your expansive bedroom and unwind after a long day. Living room – Set up your home entertainment center in the living room, then kick off your shoes and unwind by the fireplace. Kitchen – The kitchen has black appliances that match the granite-style countertops and faux-wood floors. Come by the community today and lease a stunning apartment in Spring, Texas.